The Benefice of Sulgrave was linked with that of Thorpe Mandeville earlier this century, was joined to Culworth more recently, and, more recently still, to Chipping Warden and Edgcote. 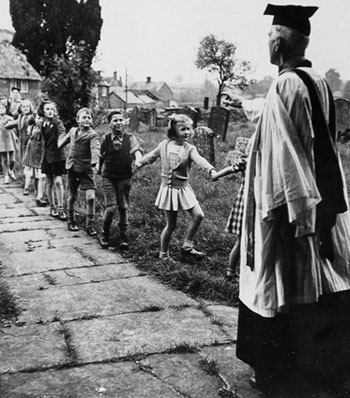 The fact that the Vicar is responsible for five churches has inevitably led to changes in the pattern of worship, the most noticeable being that each church fields its own 'Home Team' once a month for a service of Morning prayer led by lay people with participation from other members of the congregation. The Vicar's pastoral care of five churches requires that he moves rapidly between them. The possibility for social interaction is, therefore, limited and to maximise his and the parishioners opportunity for conversation, a space is being created as part of the 1992/3 church renovation to enable coffee and tea to be served after worship. The introduction of a Children's Service has had a positive impact on the church. 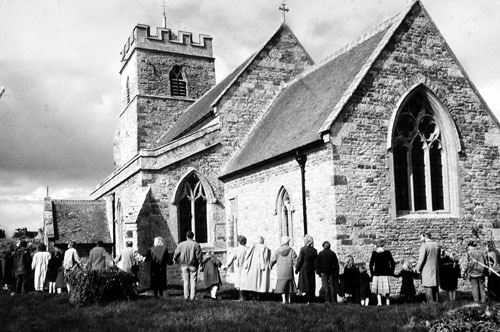 Apart from the regular weekly services, there are major events such as the Christmas and Harvest celebrations, the Christingle, and the Mothering Sunday service, which includes the ancient tradition of "Clipping the Church" at which the congregation, holding hands, encircles the church. Sulgrave Church is fortunate to have an unusually large regular congregation for such a small village and there is no shortage of parishioners with a wide range of skills, talents and enthusiasm all of which are given unstintingly. Generous help and support also comes from other villagers. Sulgrave has always supported numerous charitable organisations, both on a regular basis, such as the annual Coffee Morning held in aid of the N.S.P.C.C., and for particular causes sucha s the local hospitals and hospice. Recent fundraising events held for Cot Death Research and Mother Teresa of Calcutta both raised over £1,000. The Church gives 10% of its income to charity and the collections at services such as harvest, Christmas and Christingle are donated to specific appeals. Each year a bazaar, and on alternate years an Open Day, are held to raise money to maintain the Church. In 1991 a £50,000 fund-raising effort to renovate the building was launched. Larger efforts included a recital given by a Russian counter-tenor, which raised £1,200; a St Valentine's Day Party and Auction of Time and Talent, which raised £1,500. Appeals were sent to charitable foundations; other St James's Churches; companies and preservation trusts; many of which were remarkably generous considering the harsh economic climate (1992), and these funds plus a generous donation of £1,100 from the American Air Force based at Upper Heyford enabled the half-way point to be reached within six months. A series of small individual events was arranged to raise the money for the new heating system; a Burn's Night Party, Croquet Tournament and a Silent Auction. A Sulgrave Foundation is to be set up in the United States to encourage donations from Americans and, closer to home, a system of selling £500 debentures to individuals will raise a significant amount towards the total cost. In 1985 it was felt that the Church was offering nothing specific for the children of the Parish, and Mrs Joan Oakley offered to start a service for them. From the start it was to be a service for the children of all ages (rather than a Sunday School) with a group of helpers taking turns to conduct various parts of the worship. It is held every Sunday at 11.00 am., and is the only Church Service which takes place at the same time on a wholly regular basis. The children take an active part and have come to regard the Church as being theirs; they light the candles, read the lessons, take the collection and make entries in the register. The children are given a stamp which they collect in stamp books, record their attendance with stars on a board and are given a small present when they complete a strip of stars. The Mothers' Union has played a significant part in the life of the Church and the village since the beginning of the century. One of the early Enrolling Members was Mrs Pakenham-Walsh who had the distinction of having founded the first branch of the Mothers' Union in China when she and her husband, Canon Pakenham-Walsh, were working there in the mission field. There were originally two groups, one at Sulgrave and the other at Thorpe Mandeville. However they shared a banner, and the branch was always known as Sulgrave and Thorpe Mandeville. In 1952 a new banner was acquired, made in Winchester from materials and to a design chosen by the Members. In 1972 it was decided to cease holding separate meetings and to hold regualr meetings in each village alternately. 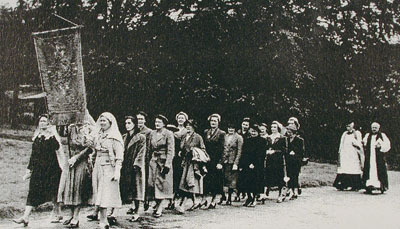 The members of the Mothers' Union play an important role in the village. Members help in the Children's Service, play the organ for services, welcome newcomers to the village, deliver christening cards, support every fund-raising effort and arrange others for a variety of causes. The Altar Guild was initiated, when Canon Pakenham-Walsh was the incumbent, by the Misses Cartwright, who lived at Threeways (on the corner of Little Street and Helmdon Road) in the early 1930s. Its aim is to care for the altar linen and church brasses, to provide flowers for the altar on a regular basis and special decorations for church festivals. The responsibilites of the Guild also included changing the altar frontals as the church year progressed. The red frontal was given by the Colonial Dames of America in 1922. Mrs Violet James, wife of the Reverend James, and her sister provided the mauve frontal and the former green one. The green frontal now in use was given in memory of Richard M. Tattersall. Beautifully embroidered cream material was given by Hon. Mrs Donner in the late 1930s for a frontal for festivals, and this was made up, with further embroidery by Mrs Stirrat, sister of Miss Emma Cave. The chalice now in use was given in memory of the Misses Cartwright, a pewter chalice previously in use having been presented to the Colonial Dames of America by the Rev. H. Barnes during his fund raising visit to America. The patten was given by Miss Burman, a relation of Mr P.W.Henn. The Oakley family gave the silver wafer box in memory of the late Prebendary, George Oakley, and the brass candlestick standing on the chest behind the organ was given by Miss Emma Cave in memory of her sister, Mrs Stirrat. The kneelers were embroidered by the ladies of the Altar Guild to a design of Mr. H. Macaree. The altar linen has, for a number of years now, been most carefully tended by Miss Emma Cave; the ladies of the Guild do the flowers and clean the brasses, working in pairs for two weeks at a time. The ladies of the Guild meet once a year, usually in February, for a general exchange of ideas and observations and to plan the annual spring clean which takes place just before Whitsun, the whole church being energetically attacked with brooms and duster, mops, polish and elbow grease.